Throughout the day today as I was scrolling through my Facebook posts I saw a recurring theme of my friends sharing support for people who have experienced recent attacks from not just the incidents in Paris, but also for the suffering experienced by so many around the world that get less attention. But this is not going to be one of those posts. I am not going to choose a side, I’m not going to aim to validate one individual’s suffering over another, I’m not going to cast out anger or hatred towards any person, but rather I will aim to touch your heart. In the next few minutes I want to inspire your soul so that your Light can shine where it is needed most. Today was a heavy day for me as I read through the different articles regarding the attacks in Paris, or the recent attacks in Kenya, or the Middle East, and I could feel the pull of my heart. I could feel the heaviness of the world not around me, but within me. I could feel the fear. I could feel the insecurity. I could feel the doubt. Almost the entire day I was filled with an energy I had not felt for quite some time. Yet this evening I began to feel something else. As I sat and asked my Self, how can I help the world a passage in a very sacred book came to my mind. One of the most profound and sacred books to my heart, Life and Teachings of the Masters of the Far East, tells a story of an experience with Jesus. A hoard of bandits and murderers began approaching a sacred temple and village. With concern the author of the book asked Jesus what they could do. Jesus replied that he would not return the hatred and anger with which the bandits approached with, but rather send them nothing but Love. The author describes Jesus literally sending forth a beam of Light towards the entrance of the ravine in which the temple was located, and as the bandits reached this point their hatred and anger acted as a mirror upon the wall of Love. As such these bandits’ horses became frightened and began bucking and throwing the bandits from the saddles. In the frenzy the men began shooting and harming each other while also having the hoard of confused horses trampling them. Eventually the bandits laid there, injured or dead as a result of their own doing. This story has been so profound for me in my life in many ways. The Law of Attraction tells us that “That which is like unto itself is drawn.” We know in quantum physics that in order for a reality to exist, mind must be present to witness its structure. In our own lives we see that when we are truly feel gratitude and expressing that outwardly, we come into contact with other individuals who demonstrate that to us, we see more beauty, more freedom, more Light. Life is, wholly and truly, an expression of what is happening WITHIN us. The world happening around us, is a metaphor of what is happening within us. How many times a day do you say to yourself how truly beautiful you are? How many times a day do you say thank you to the Source of all life for the blessing of being alive? How often do you truly loo into the eyes of another person with the intent of seeing them for more than the body they possess? How often do you tell yourself “I love you!” We see things happening around us and we think of all that we don’t have, or don’t want, or don’t like and we wonder why there is so much sadness in the world. We look around at people doing things that we wouldn’t do and we condemn them. We see people saying things we wouldn’t say and we ridicule them. We see someone acting or speaking a certain way and we so rarely choose to see them as more than their words or actions. We so rarely choose to look into their eyes and see the divinity in them. We so rarely choose to acknowledge the Spirit in them yearning to be called forth and them be reminded of who they really are. You see, what every great master has ever told us is that we need to love our foe as our brother. Jesus said when your brother strikes your cheek, you should offer the other to him also. We find parables like this in all sacred texts and yet we refuse to follow them. We do not offer our brother a helping hand, let alone allow him to harm us. And yet, every great teacher has only taught us one thing: fear is not real, and only Love exists. Fear is a reminder that you have separated yourself from Spirit. Love is the presence of your unity with Spirit. When we are shown acts of violence our reaction is to immediately attack the attacker. When we witness violent acts we do not love that person anyways, we ridicule him and berate him, which simply exacerbates feelings of isolation and separation. We have forgotten that we not only belong to each other, but that we are each other. We have forgotten that there is a single Presence, a single field of Love, and that we all exist in and as that. In times of collective fear, to further increase that fear through your own emotional field does nothing to bring forth Love. In times of darkness, more darkness is unnecessary. 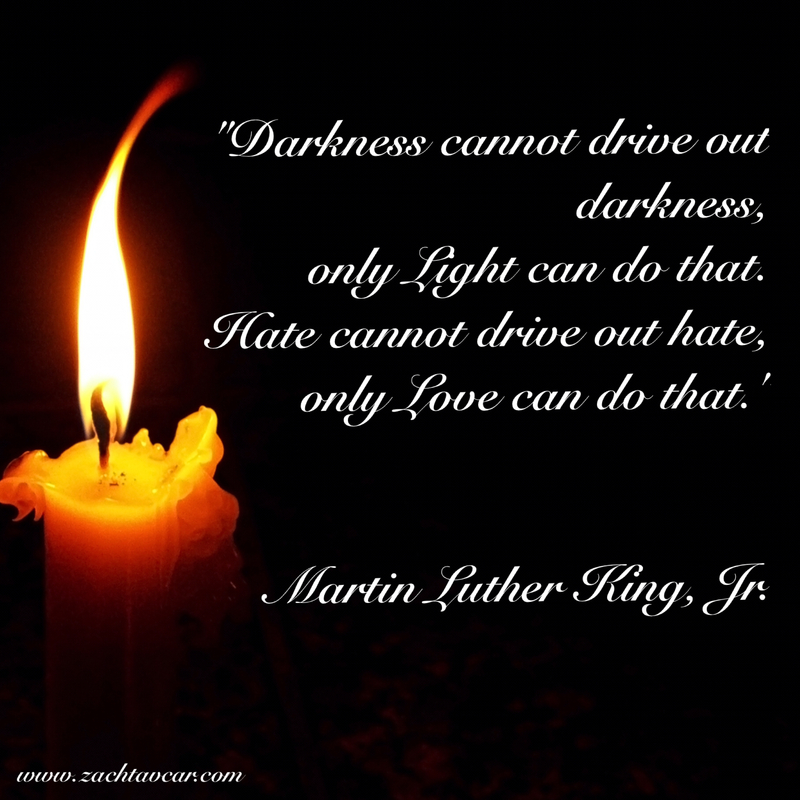 “Darkness cannot drive out darkness, only Light can do that.” In times of others’ suffering you must be reminded of the field of Love that is all that exists. You must stand forth in your strength, knowing fully that you are supported by the hoard of Heaven, and claim undoubtedly that only Love can heal. Not once have you every heard of fear healing. Not once have you ever heard of doubt healing. Not once have you ever heard of blame healing. Yet you have heard of gratitude healing. You have heard of kindness healing. You have heard of compassion healing. You have heard of Love healing. In times of tragedy, it is not time to blame, and berate, and fight against. In times of tragedy, it is time to show compassion, kindness, Love. How can you help an individual or collective through anger and hatred and condemnation? You can’t. It is not possible to help anyone through the recognition of their unworthiness. You can only help anyone through your recognition of their Light. In your acknowledgment of someone else’s beauty, only then can you affect change. No figure of change ever was praised for telling people how bad they were. The most influential people of history, the ones who are praised for their service to humanity, spoke to the souls of others. They reminded you of your ability to be good. They reminded you of your ability to have compassion. They reminded you of your ability to be kind. They reminded you of your ability to see beauty in others. They reminded you of your ability to Love, and to Love unconditionally! My friends, those of you reading this, this is your reminder. Don’t get caught in the disillusionment of the “outside.” You know all too well of your ability to affect others for their betterment and to be their reminder. You also know all too well that this can only come from the inside out. We must be the guide for others to follow, be the Light in the darkness so that others may light their own candle. My friends, my dear brothers and sisters, YOU have to be the change for the world. If you get lost in the woods, remember the path is always right next to you, waiting for you to remind others that it is right there…just below the head and about the gut.